TouchKitchen transforms the way food orders are processed. From starters through to dessert, a customer’s choice is displayed on a screen in the kitchen with no need for paper and print-outs. TouchKitchen When staff take an order, TouchKitchen receives information directly from the TouchPoint till system or PocketTouch hand-held order pad. Chef can easily manage each order as it arrives and prepare food straightaway. Kitchen staff have complete control including the ability to view, sort or peg meal orders, and set preparation timers to ensure nothing is forgotten and meals go out on time. 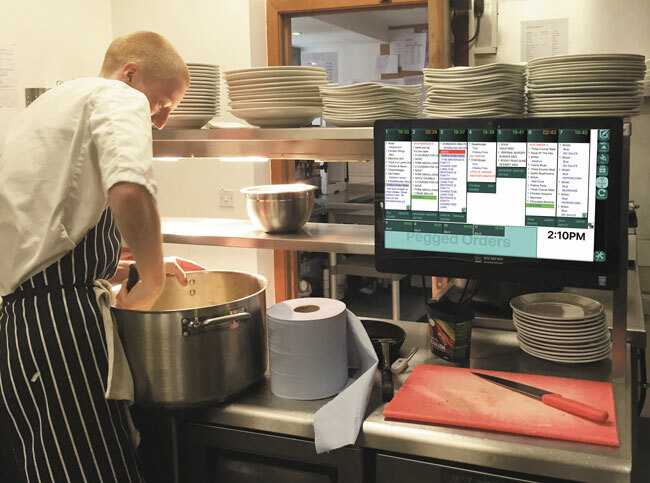 TouchKitchen displays orders on either a tablet, smartphone or display screen, mimicking traditional paper orders or print-outs, therefore reducing mistakes. Orders can be shelved between courses and cleared when the entire meal is completed. Information is clear and legible, and there is no room for misunderstanding what has been ordered. Orders can’t be misplaced and they can be recalled even after they’ve been cleared. Urgent orders can be received with favourable timers to get them through quickly. Linking with digital signage alerts customers that an order is ready to be collected, or a ticket can be printed at the counter to signal waiting staff for service. Customise your theme and add your logo to match your branding.